From artnet.com/Magazine/reviews/karlins2/karlins5-24-9.asp. Also posted to Louise von Alten-Montagu-Cavendish, Duchess of Manchester-Devonshire’s new Subalbum here. 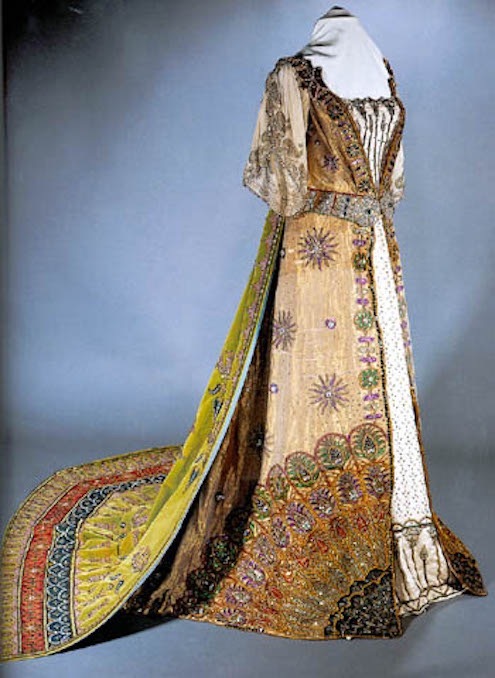 It is described as, "A ball gown with an under-robe of cloth of silver, wrought all over with silver thread and brilliants, and with an over-dress of green and gold shot-silk gauze, embroidered to the waist with green and gold metalwork, decorated with jewels. A long train of turquoise velvet, embroidered in gold to an oriental design, was attached to the shoulders. A bodice of gold cloth and lace was fitted over a whalebone corset into which her waist was tightly laced. The headdress that went with it has not survived, but it can be seen in Lafayette's photograph. This dress could be called an open robe with an under- and over-dress plus a shoulder train.